The founder of Mertens-Kunst was Alfred Mertens, born in 1898. Later on, his children took over. Alfred Mertens’ son led the manufactury and his daughter Ute Mertens (1937-1996) became the artist from the 1960s. Mertens-Kunst produced until the 1990s. 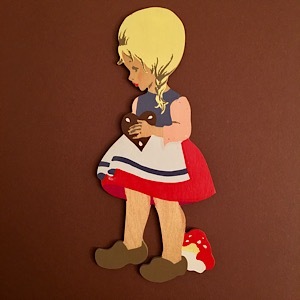 Bino.de currently sells wood toys and it carries the last Mertens-Kunst Logo and “Mertens GmbH” on their website. Wall figures are not being produced by “Mertens” anymore. The last ones were printed around 1990. 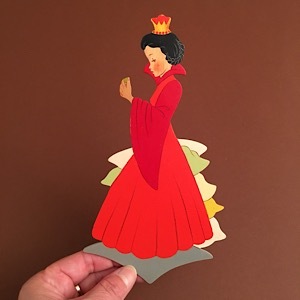 Hand-painted on 3mm-plywood and very very pretty! Hand-painted on 3mm-plywood with shining varnish. This Cinderella comes with white and with grey doves. Hand-painted on 3mm-plywood. Beautiful color scheme and touching with the too big shirt and the patched up dress. Early screenprint. There are many different Mertens-Kunst Cinderellas, many of them having the same number. 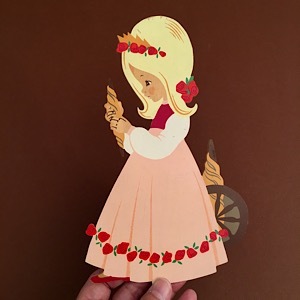 There is a similar Mertens version with Cinderella raising her apron, only with red vest and red bun. 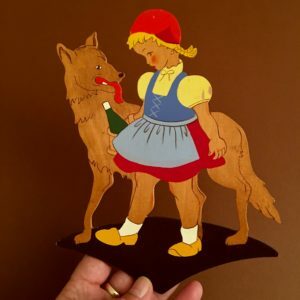 "Modern Fairy Tales" by Mertens-Kunst: Those 1980s versions were the last ones produced by Mertens-Kunst. Early screen-print on wood with added hand-painting, quite rare. The orange-red hair is rather unusual, combined with the red vest. I think there's only one wooden wall figure with an ermine collar, not by Mertens-Kunst and not by other producers. I love the bright colors here! Colorful bases very often equal beautiful wall figures with Mertens-Kunst. This version was very popular, probably because it's so cheeky and engaging, screen-printed on 3mm-plywood. One of my favourites, wonderful design with light colors. Not hand-painted anymore, early screen-print on 3mm-plywood. I like the put up braid and Hansel hiding his gingerbread cookie. This wall figure belongs to the four seasons series by Mertens-Kunst. It is one of the cutest of them all! Screen-print on 3mm-plywood. 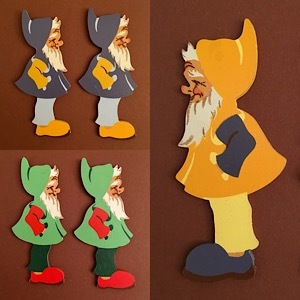 From the 1960s onwards Mertens-Kunst started to produce wood pictures without the brown base. This wall figure belongs to the four seasons series by Mertens-Kunst, with a beautiful color scheme. A real highlight! 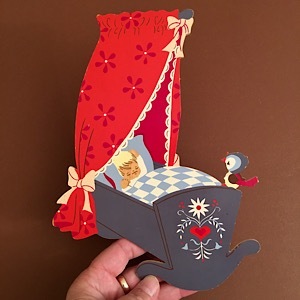 "Schlaf Kindlein, schlaf" is a German lullaby. This wood picture belongs to the lullaby-series by Mertens-Kunst. An absolute early Mertens-Kunst highlight and so rare, too! I have only seen this one item so far. Look at their faces! Hand-painting also means that no face is like the other! Hand-painted on 3mm-plywood with bright colors but matte varnish. I like the black bow and the basket with the cake. The very last fairy tale designs by Mertens-Kunst. Not the German TV-Sandman, that wasn't invented till the 1950s. 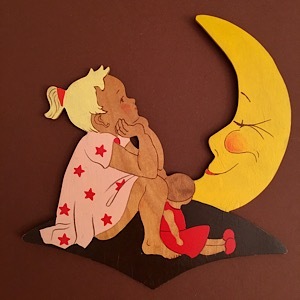 This is a classic sandman, hand-painted on 3mm-plywood. Hand-painted on 3mm-plywood. This is a classical traditional sandman, not the two German TV-Sandmen that came later in the 1950s. One of the Snow Whites in yellow-white dress. This one has a yellow hair bow to boot, the others don't. Look at the wonderful color scheme! Early Mertens, rather rare, extremely beautiful. Hand-painted on wood and one of my favorites! Look at the raven she's holding! Look at how he looks at you! Beautiful and rare. Hand-painted on 3mm-plywood. A beautiful and rare color scheme for the Seven Ravens by Mertens. Screen-printed on 3mm-plywood with added hand-painting and rare. 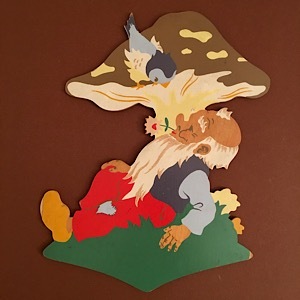 These were the last fairy tale wood pictures produced by Mertens-Kunst. All of them screen-printed on 3mm-plywood. Look at the bubbles: The baby pink lines make them shine! Very beautiful, very rare, very hand-painted! Look at his beautifully wide clothes, the bellflower shaped cape, the flared trousers. And a pretty color scheme, too. One of the early orange wood pictures, rare and beautiful. Orange is a color that Mertens-Kunst did not use very often. Here it is part of a beautiful color scheme. Top left you see the most famous Mertens dwarf group, below right the oldest one I've known so far. 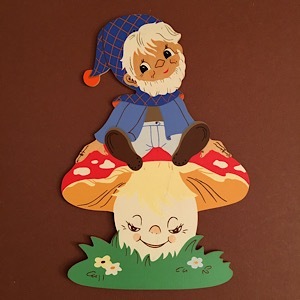 The most popular one was the dwarf with his hat in fly agaric mushroom colors! 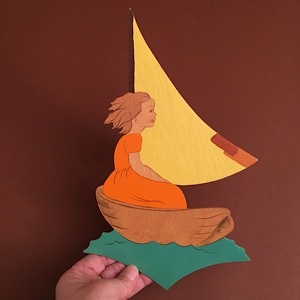 This figure is a design not yet drawn by Ute Mertens, the sole designer of the 1970s. 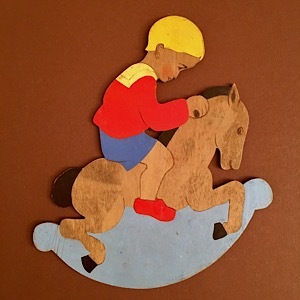 One of the early jumping jacks by Mertens-Kunst: Hand-painted on 3mm-plywood and with metal joints.